A 4 scene action sequence panorama. This is the equivalent of an 11 megapixel image. 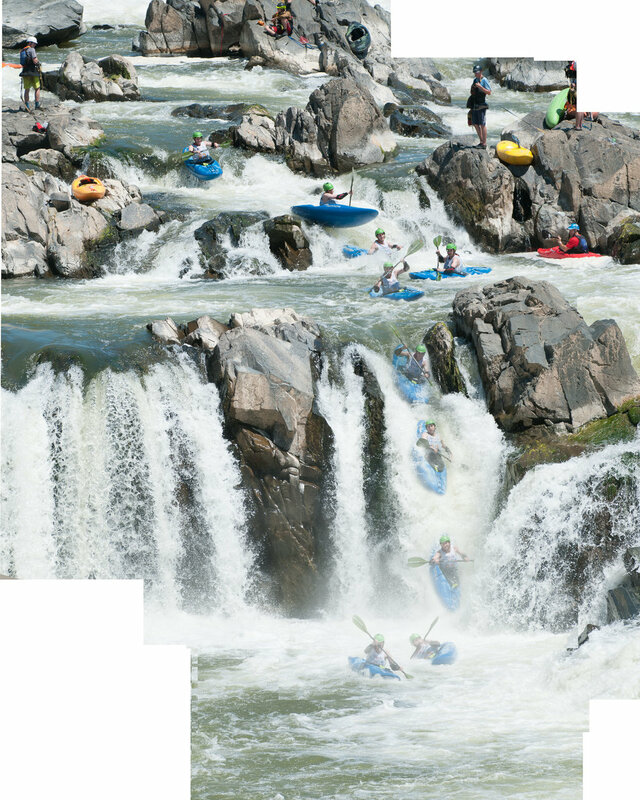 After watching and photographing world class kayakers paddling Great Falls on the Potomac River I wondered if I could assemble any of the images I’d created into a single action sequence image, showing the athlete at various positions all in the same photograph. I hadn’t exactly shot with this end goal in mind, so I wasn’t sure if it would work. If I had planned for it I might have used a wider angle lens and locked the camera down on the tripod. 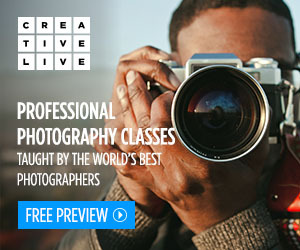 I would have used a small enough aperture to capture the entire course in focus. Then I would have simply clicked the shutter every so often as the athlete maneuvered downriver. I could have merged these into a single image in Photoshop with minimal difficulty because each image would be of the same part of the scene and the only change from image to image would be the moving subject. But I didn’t plan ahead this time. I didn’t use a wide angle lens. And I didn’t lock my camera down on the tripod. 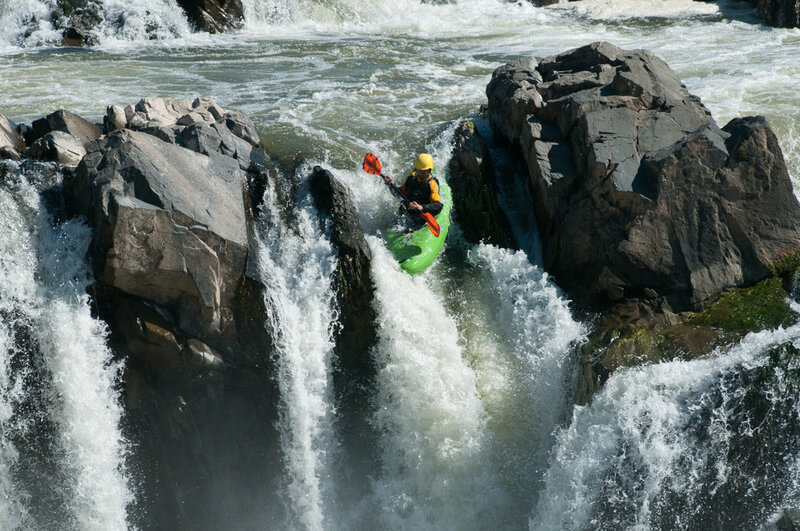 I used a long telephoto with a large aperture and panned with the kayak. This meant I wasn’t going to create the standard sort of action sequence, but instead an action sequence panorama, where the camera moves between images. George Lepp wrote a great article about this in 2011 at Outdoor Photographer magazine. It might have been nice if I’d read this article first, but that’s why I’m sharing it with you, in case you want to give this a try. Keep in mind this is an older article so the current version of Photoshop may include features that make this process easier that the method mentioned in the article. As you can see in Lepp’s article the panoramas he creates show his subjects moving parallel to him. That means the depth of field stays consistent so he can use a large aperture and still easily merge the photos in Photoshop. A 5 scene action sequence panorama. This is the equivalent of a 19 megapixel image. Unfortunately, in my case the subject was moving towards me. This caused problems with depth of field when stitching the photos together. The shallow depth of field shifted towards me as I followed the kayaker. I think there are likely ways to make this work in Photoshop. An 8 scene action sequence panorama. This is the equivalent of a 37 megapixel image. Another issue I ran into due to my lack of planning was not knowing if I had enough of the course captured in the images to create a larger multi-frame panorama of the scene. And as it turned out, in at least one of these sequences I hadn’t captured enough. So I tried using Photoshop’s Content Aware features to manufacture the missing pieces. It did a reasonable job in some cases and a not-so-reasonable job in others. But I present them all here for you to see. It gives an idea of some of the capabilities and limitations of that tool. I do believe a more skilled user could make better use of these features, so I keep practicing and learning. I encourage you to do the same. One feature, or side effect, of creating stitched panorama images, wether they be standard stitched panos or these action sequence panos, is a potential increase in the size of the image. Stitching many photos together can increase the total number of pixels in the image, even when overlapping images to assist the software during the stitching process. These were all shot with an 11 megapixel camera, and you can see in the descriptions the end results varied from 11 to 37 megapixels. More megapixels can be good if you want to create a large print, or it can be bad if you’re limited in hard drive space and computer processing power. But it’s important to realize doing this can result in some very large image files. A 10 scene action sequence panorama. I didn’t capture enough of the scene to correctly create the final image. Because I was missing parts of the scene I attempted to use Photoshop to “create” the missing parts. This shows both good and bad examples of Photoshop’s Content Aware Fill feature. This is equivalent to a 26 megapixel image. Have you ever attempted action sequence panoramas? If not, give them a try, and let me know about your experiences. A slow shutter speed of 1/60 sec shows the movement of the water, making a more dynamic photograph. 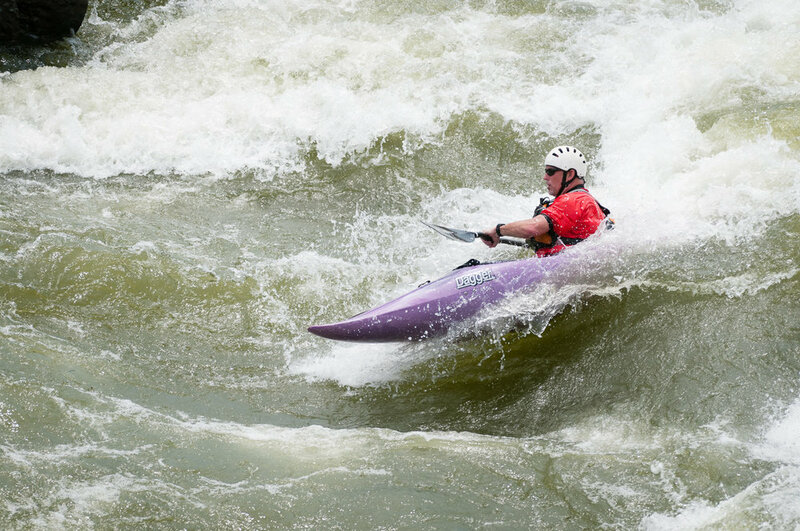 The Potomac River is a popular location for whitewater sports such as kayaking. 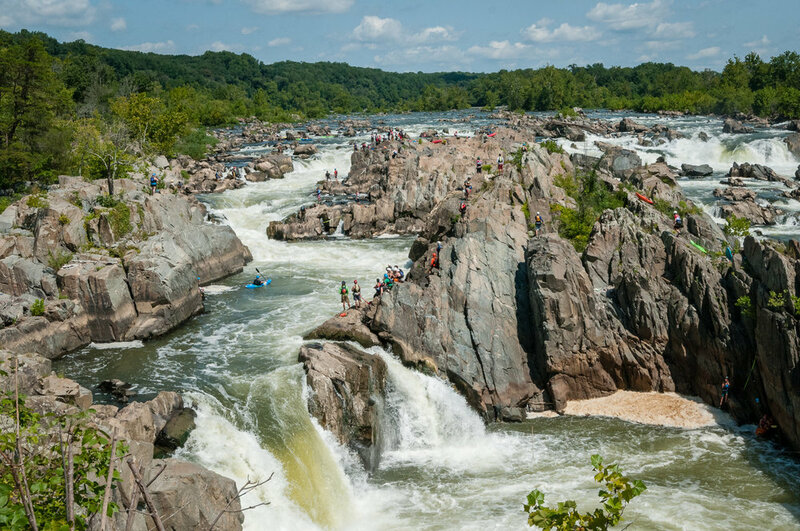 Between Maryland and Virginia, not too far from Washington, DC, the river narrows and drops in elevation, creating a number of fantastic world class falls. Riding the wave. A shutter speed of 1/100 sec is a nice balance between slow and fast. Just below Great Falls the river levels out a bit and provides some nice rapids. This is a great location to ride the waves, with spots where kayakers can maintain their location on the river, as if they were surfing a wave on the ocean but without moving forward. Slicing through the water. This time the shutter speed was 1/160 sec. The kayaker in this post was riding in such a location. In one of the photos you can see him smile as he holds his paddle horizontally, riding the crest of the wave. Kayakers were rotating through this location. They would each spend enough time there to get a real workout and enjoy the feel of the river. Then they’d move aside and let another kayaker ride that wave. Big smiles, enjoying the wave. Shutter speed for this image was 1/200 sec. For these photos I tried a range of shutter speeds. You can create a number of different looks by changing your shutter speed when photographing fast action like this, especially when water is involved. Use a fast shutter speed and you can freeze the action, showing individual drops of water hanging in mid-air. 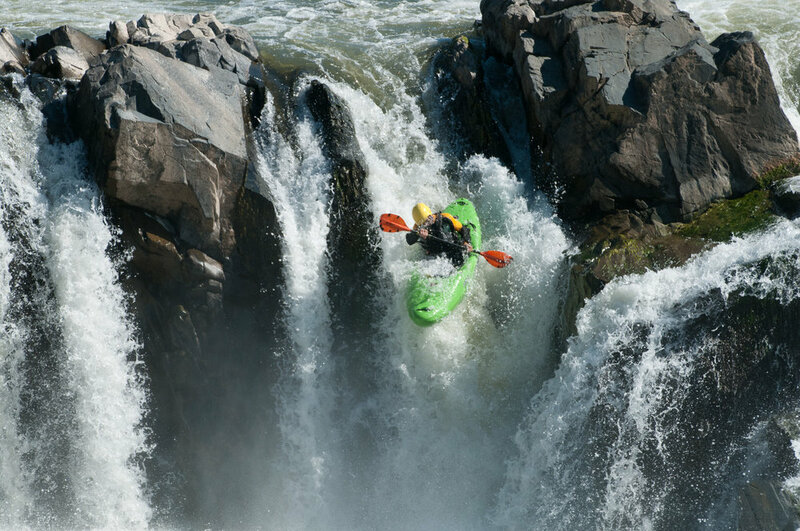 Use a slower shutter speed and you can really show the motion and action as the water flows around the kayaker, his paddle blurring as he maneuvers it. A fast shutter speed of 1/1250 sec freezes most of the water, showing individual droplets. 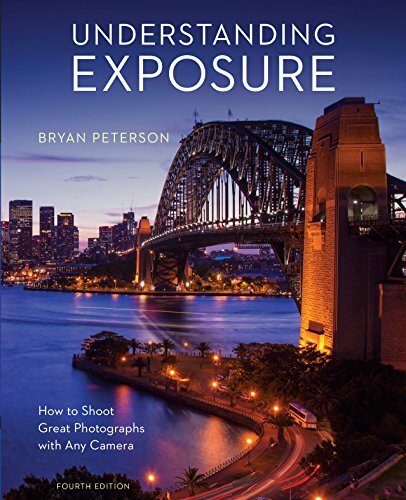 See how dynamic the action can look at a slow shutter speed of 1/60 sec. 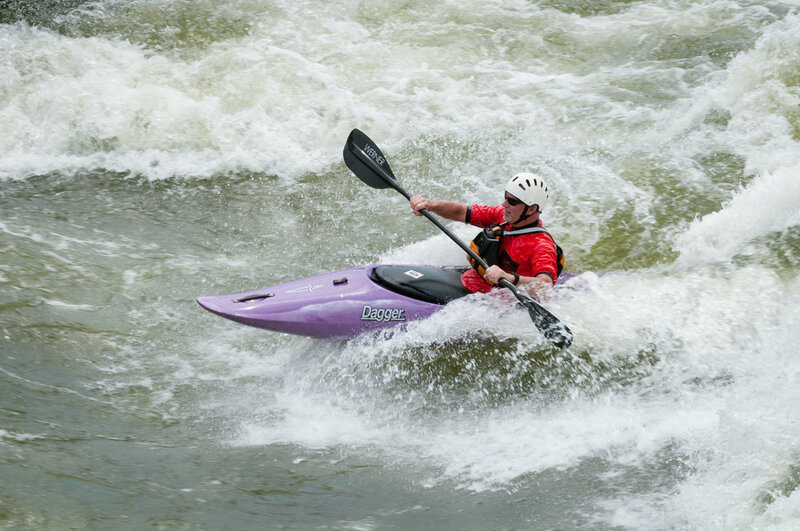 If you ever have the opportunity I encourage you to find a location where you can watch and photograph kayakers, then leave a comment below and tell me about your experiences. I hope you enjoyed this post. If so you can subscribe to my email list to hear about new content. I typically send an email each week and you can easily unsubscribe if it’s no longer to your liking. The Potomac River rushes by as people prepare for the race. A slalom pole can be seen to the left hanging over the river. 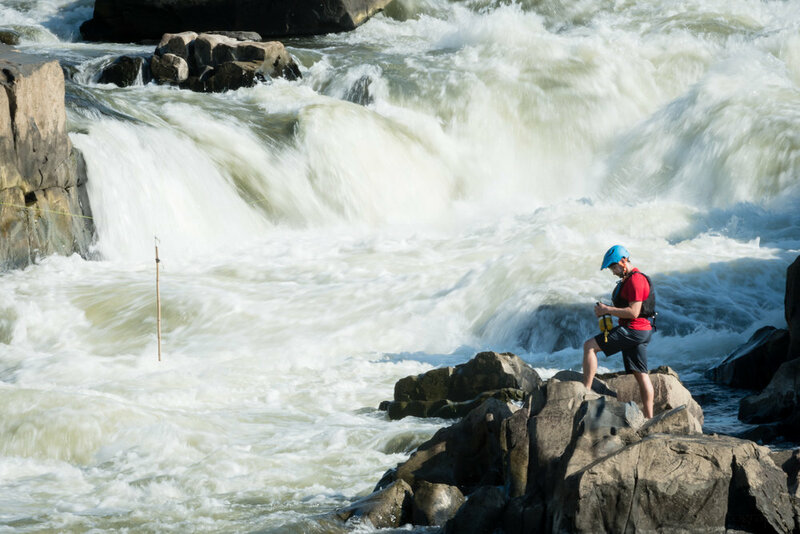 In previous posts I’ve shared photographs of the racers in the 2017 Great Falls Race, an annual whitewater event on the Potomac River near Washington, D.C. where kayakers and canoeists compete on the Class V rapids. In this post we take a look at some of the people who work the race, setting it up, monitoring and running it, and providing safety support when needed. Without these people there would be no race. Working the race involves first getting to the edge of the river. People arrive by boat, haul their boat onto land, then set up at the edge of the river. The folks who work the race arrive just as the contestants do, by kayak, canoe, or boat, over the river to the rocks on either side of the race lines. They have to haul their boats out of the water then hike over the rocks to the waters edge. Some locations are more difficult to get to than others. Setting up near the finish line to the race. This is below the last large fall. Some of them run lines across the river to mark parts of the race. Some of the lines will hang the slalom poles which can be lowered during the slalom portion of the race and raised back out of the way during the classic race. Lines are run across the river before the race. 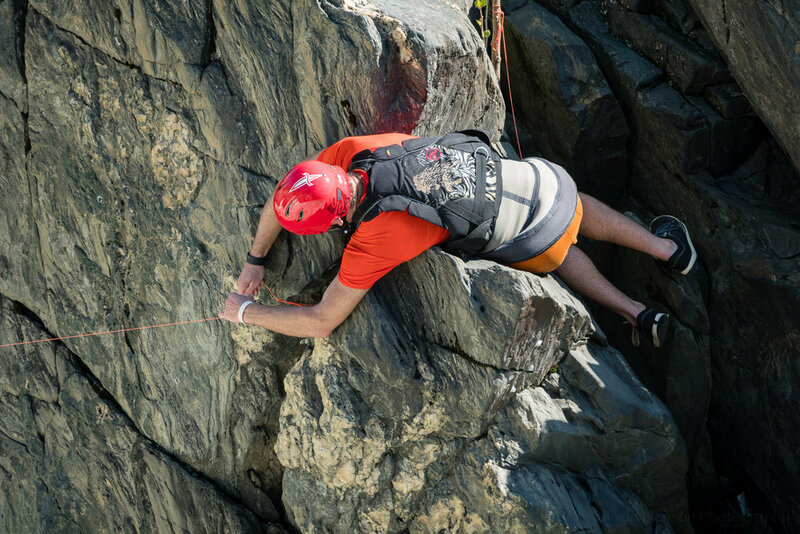 Securing one end of a line to the rocks. Some of the lines they run are safety lines to assure they don’t get swept away if they fall into the water. These are world class rapids with large volumes of water moving very quickly. You can see many of the people on the rocks have these safety lines. People setup on both sides of the river. Notice all the lines, some marking parts of the race, some hanging slalom poles, others for safety. There are also people strategically staged along the course in kayaks ready to assist anyone who needs it in the water. Thankfully, it isn’t needed very often, but it’s good to have that support there when it is needed. Sometimes people need assistance in the water when their boat overturns and they get pulled out into the river. These races involve a lot of people, both in the race and behind the scenes. To any of you out there who do work these events, setting them up, tearing them down, working the river, know that your efforts are noticed and appreciated. 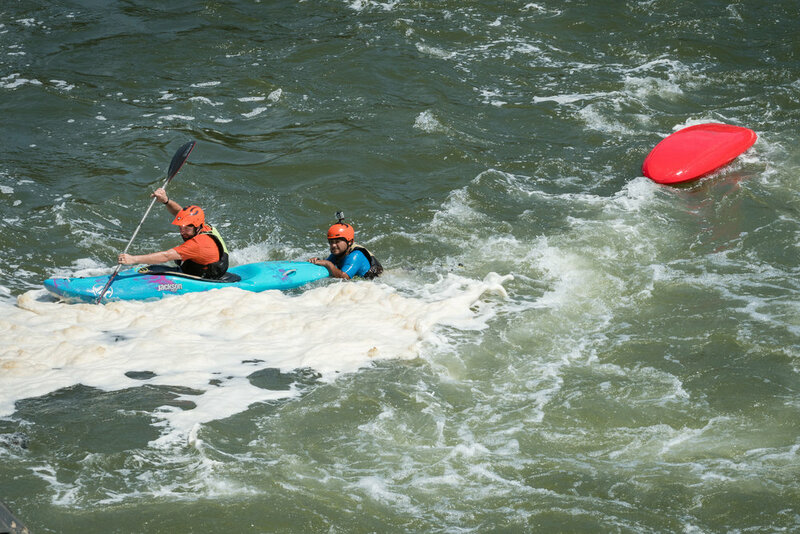 These amazing whitewater events are possible because of the hard work of the many people who work behind the scenes, along the river, and on the river. A wide angle view showing the large numbers of people on the rocks. Some are race contestants, others are working the race. The resources below contains affiliate links and I will be compensated if you make a purchase after clicking on my links. This is at no extra cost to you.